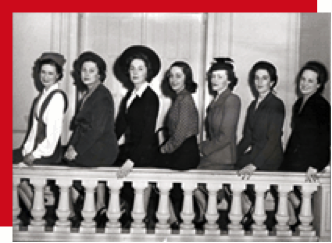 Since 1921, the Junior League of Sioux City has played a significant role in the development of our community. 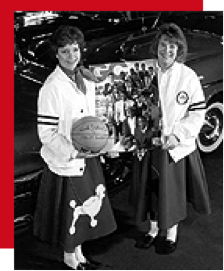 The organization's mission "to address community needs through the participation of trained volunteers", has endured through the decades. This mission contains two important components: to improve the community while providing a training ground for members. Both are critical to the success and longevity of the Junior League. Because the needs of the community and the make-up of the membership are ever changing, the strategies employed to achieve these dual goals have evolved over the last 95 years. A sampling from the scores of Junior League sponsored projects reflects the problems and concerns of each era. In the 1920s, a Well Baby Clinic was established in City Hall to meet a need for postnatal infant screenings. Because childhood illnesses were more likely to result in deafness before the days of immunizations and antibiotics, an audiometer was purchased to test the hearing of every private and parochial grade school student in the district. The war years brought a nursing shortage, so League members funded scholarships by staffing a hospital cart selling candy, magazines, and toiletry articles to patients. The Junior League of Sioux City was instrumental in the establishment of a Treatment Center for the Handicapped following a polio epidemic, and when Dutch Elm disease devastated tree-lined streets, Junior League's participation in "Project PEACH" (Planned Environmental Action Can Help) beautified our city for future generations. Other Junior League projects have focused on the cultural and educational needs of area children. Many adults raised in Sioux City had their first experience with live theatre when Junior League players trouped to grade schools with productions such as "Bird's Christmas Carol" 1938 and "Hansel and Gretel" in 1977. League-sponsored Symphony performances staged especially for students enthralled thousands of Siouxland youngsters in the '30s and '40s. Third graders from several area districts still experience a day at Fairview Schoolhouse - a bicentennial project League members developed and staffed until 1988. 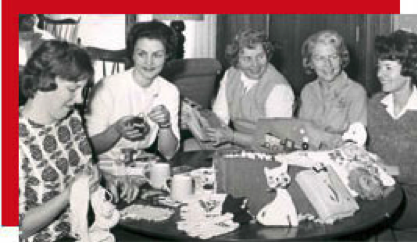 Junior League members have always gained valuable training from their efforts in community projects. The internal functions of Junior League have also provided volunteers with a variety of interesting placements. Publishing a monthly Junior League magazine, learning business practices in the operation of the Discovery Shop thrift store, arranging facilities and refreshments for large meetings, mastering a computer program - these are just a few of the challenging experiences available to the Junior League membership. The opportunities women find through Junior League involvement invite risk taking and personal growth. Many discover unsuspected talents and develop organizational and leadership skills. Women with Junior League training have traditionally applied their acquired expertise to other endeavors in the non-profit and professional sectors. This legacy from trained volunteers who have used their Junior League knowledge to benefit countless community groups and undertakings may arguably be the most important contribution provided by the Junior League of Sioux City.